Getting ready for next Tuesday’s big event. Attended school for election officials today. 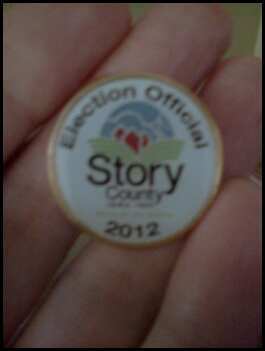 Got my pin, too. Two hours of new procedures, a few new machines, and connecting with the teams at the various voting locations. For the first time, I’ll be working in my home precinct. Usually I have to vote in advance–they don’t always assign us to our voting location, and we’re not permitted to leave a site to vote. Or do other things. Some of the other officials like to be the first to cast a vote. Like many of my brother and sister Iowans, I went ahead and voted today at the school. Election Day is a long day for us in Iowa–I like to get voting taken care of so I can pay attention to helping others vote. We arrive on site at 6AM, set up our stuff, take our oaths, and get ready to open the doors at 7. Most people sail through the lines and vote in a handful of minutes. We have set procedures for registering voters on Election Day (see if you can do that in your state) for assisting voters who need it, even if they can’t leave the car. We have to make sure everybody behaves themselves. Lots of stories were exchanged–unusual things happen on Election Day, as you might imagine. Some people have been working for decades. Blogging will be light to non-existent on next Tuesday. Now you know why. Get out and vote. If you are in Iowa and not registered, you can register and vote on Election Day. If you live in another state, you have time to contact your county auditor, get information, be prepared to register, find out if redistricting has changed your voting place, and be prepared to exercise your responsibility for civic participation.